Animal Models in Cardiovascular Research covers both historical and recent advances in our understanding of the cardiovascular system from studies conducted in animal models. The last decade has seen an explosion in the use of very specialized congenic and transgenic animal models that were not described in the previous two editions. The results of many of these studies provide a sometime bewildering array of redundant, overlapping and competing molecular pathways demanding further study. This third edition is designed to provide a better basis for understanding and using animal models in the current climate of background knowledge and information and is focused on the avalanche of genetic, molecular and protein-based information generated from the use of both congenic and transgenic animal models. 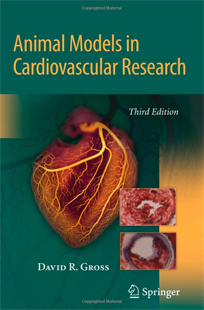 Updated and expanded chapters provide new information generated from classical, congenic and transgenic animal models used to study ischemic heart disease, cardiomyopathy, heart failure, hypertension and atherosclerotic disease. Completely new chapters describe the techniques, problems and pitfalls associated with the measurement of cardiac and vascular function and ventricular/arterial coupling dynamics in various animal models. There is a new chapter detailing problems and pitfalls associated with isolated heart preparations and another describing animal models for the study of neurohumeral and CNS control of the cardiovascular system. Or purchase the eBook or other editions directly below!